Traveling is about being inspired, making new discoveries and collecting meaningful memories. And all of that begins with learning a bit about your destination! Are you ready to find out a few key details about Havana? Jaruco is 19 miles (31 kilometers) east. Santa Cruz del Norte, another interesting area, is 20 miles (32 kilometers) away. Forget the big-name attractions — it's the locals that really make a place tick. In this part of Cuba, you'll find 2,200,000 of them. Gain undeniably good bargains on package deals via Travelocity. Simply pick from more than 400 airline partners and 665,000 accommodations, and you'll be off to Havana in no time at all! Our Customer 1st Guarantee gives you the security of 24/7 personal assistance on everything from airfares and accommodations to rental cars and activities. Have you stumbled upon an even better bargain? We'll meet the price and give you back the difference^. All vacation reservations may be easily canceled or rescheduled with no extra charge from our end. And as long as you get in fast, most accommodations won't charge you a fee either^. Where do you fly into for Havana? Say hello to new adventures in Havana. Once you've left Jose Marti International Airport (HAV), the central area will be 8 miles (13 kilometers) to the northeast. Can I rent a car in Havana? Forget buses and overpriced cabs. If you want to do some serious exploring while in Havana, it'd be wise to reserve some wheels via Travelocity. We make it so simple that you'll be fine-tuning your road trip playlist in no time! Unfortunately, there are no car rental businesses near Jose Marti International Airport. You'll need to flag down a cab or investigate public transport if you want to venture the 8 miles (13 kilometers) into the city. History is the ultimate teacher. Drink in the knowledge and learn from days gone by at Ernest Hemingway Museum. Want some more ideas? It's not easy to imagine how generations past coped at home without all the modernized appliances we rely on today. Take a look around House of Jose Marti and find out exactly how they did. And that's not all there is. You don't have to be a graver or tombstone tourist to appreciate a stroll around Christopher Columbus Cemetery. Why not see if you can join a guided tour and learn some of the history behind this intriguing graveyard? Jibacoa is loved by adventurers. It can be found 30 miles (48 kilometers) from Havana, and you won't have to look far to find things to do. Jibacoa Beach is the perfect place to start understanding the culture of this destination. Hershey Gardens and Central Camilo Cienfuegos are also well worth your time. After more options? Las Terrazas is 45 miles (72 kilometers) from Havana. Visit for attractions like Arco Iris Waterfall, Salto del Arco Iris and Castillo de las Nubes. You have all the options in the world! What currency is used in Havana? The Cuban convertible peso (CUC) is what you’ll be using to make your purchases in Havana. What is the best place to stay in Havana? If you’re itching to soak up Havana’s stunning architecture, base yourself in Habana Vieja (Old Havana). Located about 2 miles from downtown Havana, it’s a popular area with tourists. Expect to find some excellent luxury and budget accommodations. 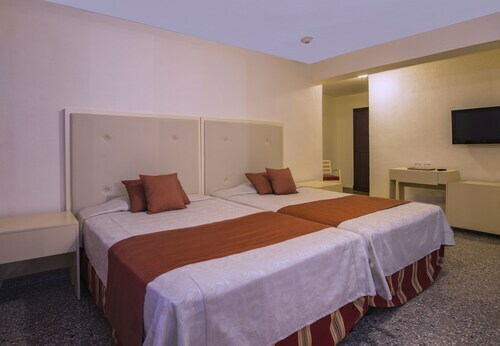 Centro Habana is filled with hotels and other accommodations that’ll suit travelers of all budgets. 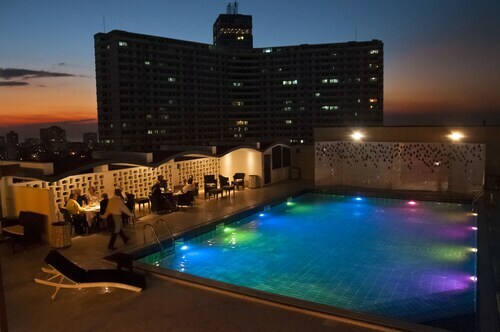 Catch a show or sit back with a drink and enjoy this neighborhood’s vibrant nightlife. It’s located about a mile from the downtown area. What is Havana famous for? No visit to Cuba’s capital city is complete without exploring Old Havana. It’s here you’ll find charming cobbled squares, architectural gems and fascinating history museums. Sip on a coffee in a café in Plaza Vieja and take note of the surrounding highlights, including Casa del Conde de Jaruco, an 18th century building with stunning stained-glass windows. 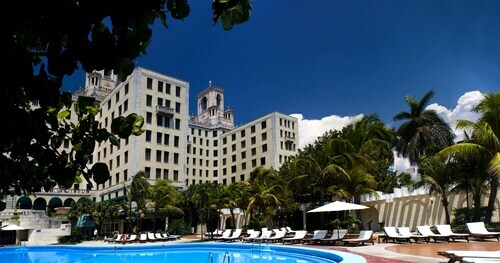 Located in El Vedado, this hotel is within a 15-minute walk of Malecon and University of Havana. Great Theatre of Havana and Museum of the Revolution are also within 2 mi (3 km). 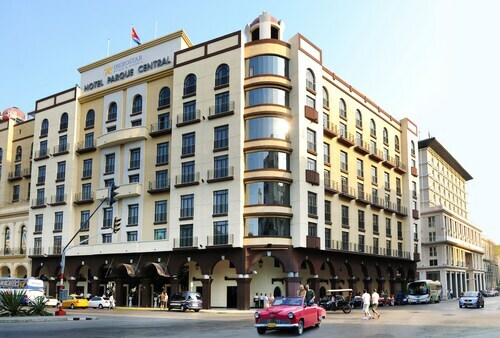 Located in Centro Havana, this hotel is within 1 mi (2 km) of Paseo de Marti, Malecon, and Plaza Vieja. Castillo de San Salvador de la Punta and Museum of the Revolution are also within 15 minutes. Located in Old Havana, this luxury hotel is within a 10-minute walk of Paseo de Marti and Malecon. Plaza Vieja is 0.8 mi (1.2 km) away. Located in El Vedado, this hotel is steps from Galerias de Paseo and Malecon. Bertolt Brecht Cultural Center and Cuban Art Factory are also within 1 mi (2 km). Located in Municipality of Playa, this resort is 0.6 mi (1 km) from National Aquarium and within 3 mi (5 km) of Maqueta de la Habana and Palacio de Convenciones. Pabexpo Convention Center and Green Gables House are also within 3 mi (5 km). 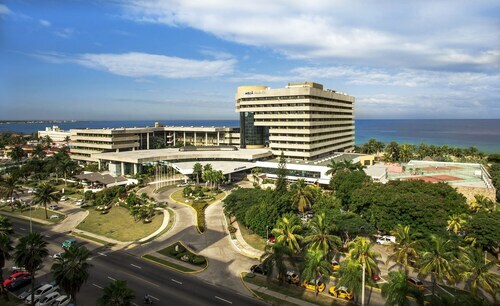 Located in El Vedado, this hotel is within 1 mi (2 km) of Coppelia Havana and Malecon. Plaza Vieja is 2.5 mi (4 km) away. 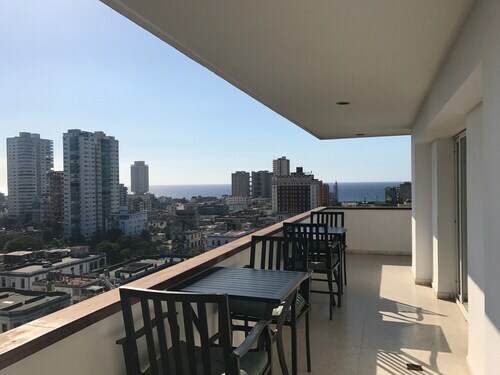 Located in Municipality of Playa, this hotel is 0.8 mi (1.2 km) from National Aquarium and within 9 mi (15 km) of Maritime Museum and Plaza de Armas. National Museum of Natural History and Castillo del Morro Lighthouse are also within 9 mi (15 km). Located in El Vedado, this guesthouse is within 3 mi (5 km) of Cuban Art Factory, La Bodeguita del Medio, and Plaza de Armas. Fort of Saint Charles is 4.2 mi (6.8 km) away.